first off: i promise, this is nothing like a treatise. well, maybe kind of, sort of. but not really. hopefully, much less pretentious at the very least. as you may know, i'm getting married next march. i have a semi-modern view of weddings and am not keen on excess, stress, bridezillas, and traditions that are stupid. among those traditions i deem stupid are floral centerpieces. now, i just want to say here and now: if you like floral centerpieces, or had them at your wedding, please don't hate me. i like flowers a lot, and in fact have them in my house in a vase almost every week (and now i'm sounding like a flower apologist) but here's the deal with me and flowers at weddings: they are one of the most overpriced items you can get, add very little to the overall awesome of the wedding, and they die. i mean, let's say an average wedding has 100 people - that's probably 10 tables (and 10 centerpieces) and maybe a couple others for the accent tables and cocktail tables. each centerpiece ranges in the hundreds of dollars - and for what? if it's big, chances are it will block the guests view of each other during dinner. if they are small, they blend in, or perhaps don't look great. and what happens at the end of the night? people take them home hopefully - but you never see them again. so what am i doing about centerpieces? right - to the point, indeed. as i said, our wedding is semi-modern: part of this is due to the fact i am cutting many of the traditional aspects of a wedding but largely, mike and i like simple, clean, modern things. when we began wedding planning, i told mike i'd like our primary "wedding color" to be yellow because my favorite flower is yellow freesia. browsing theknot.com's "yellow wedding" section i saw a centerpiece like this and thought MAN THAT IS AWESOME AND NOT A FLOWER. it was truly love at first centerpiece. or something. i've been putting off buying the vases for these bad boys for a while because i wasn't sure what size (or number) i wanted - and frankly, vases seemed expensive whenever i looked for them. but yesterday mike and i were in ikea buying a futon and i happened upon this set of three cylinders for $12.99 each, with floating candles sitting next to them - $5.99 for 24 candles. long story short, we bought eight sets. right now the centerpieces are burning away on our kitchen table and i'm timing how long the candles last (ikea doesn't give you a range on the box). 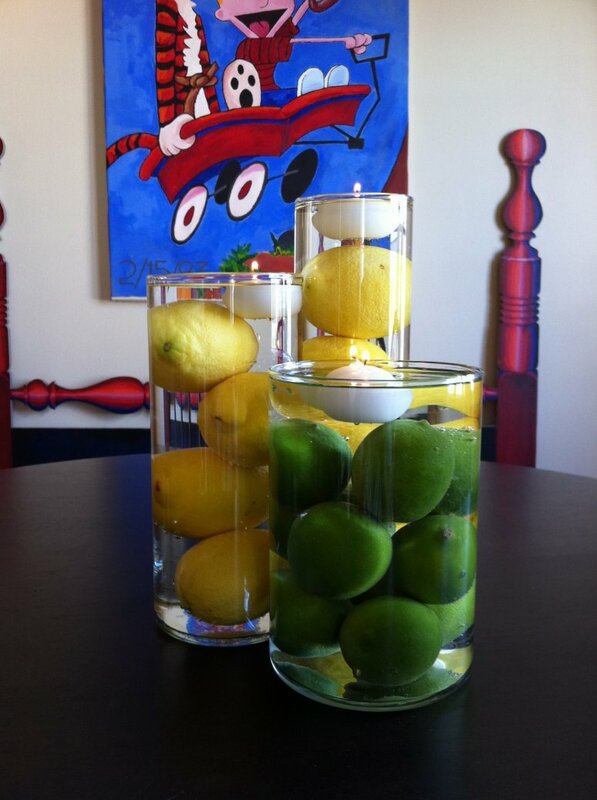 all told, we spent about $120 on the hardware and candles and i think we'll spend about $68 on the lemons and limes (four lemons to a cylinder and nine limes for the squat vase). the end result? mix and match shapes and sizes - bright, colorful centerpieces that are whimsical and non-traditional - and at the end of the night when people take them home, they'll be able to make lemon cupcakes. or limeade. and that, my fellow blog readers, is just pure awesome. 0 Comments on "a treatise on the woes of floral centerpieces"